By default, RPG Maker allows you to have skills or items repeat a certain amount of times when you use them. 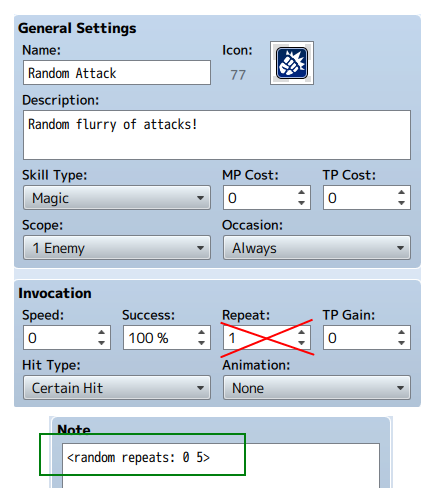 For example, if you want an attack to always hit two times, you would set the “repeat” field to 2. However, what if you wanted to create a skill or item that will repeat a random number of times between a given range? This plugin gives you the ability to do just that quickly and easily! Download the plugin and place it in the “plugins” folder in your project’s “js” folder. Then open your Plugin Manager (F10), double-click an empty row, and select the RandomRepeats plugin. Where the min is the minimum number of times the skill will repeat, and the max is the maximum number of times the skill will repeat. A random number is generated from this range. is this compatable with yanflys battle engine? I am not sure, but you can try it out and let me know. This is great! It feels more “rewarding” having a chance of hitting a lot of times than always hitting the same amount with a chance to miss each hit. The example I was thinking of was some pokemon attacks where you randomly hit 2 to 8 times or something. But there’s definitely a lot of use cases.